We have all felt like a zombie at some point. This deck features 52 unique zombies in the middle of their everyday routines, and was illustrated by renowned zombie portrait artist Rob Sacchetto. Contains original artwork on the front and back of each card, as well as the tuck. Same ole finish. 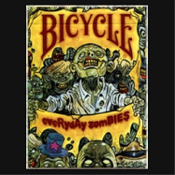 Bicycle eveRydAy zomBIES Playing Cards feature the illustrated work of artist Rob Sacchetto. Sacchetto's one-of-a-kind card creations are featured only in this unusual deck. eVeRydAy ZomBIES Playing Cards have a common back design and 52 different face card designs. Each card face displays a zombie doing some sort of everyday activity – running, taking out the trash, talking at the water cooler, playing football, doing laundry, teaching school, and much more. eVeRydAy ZomBIES Bicycle Playing Card Decks are poker size, and they are made on top-quality, Bicycle brand card stock. For all card games, including blackjack and poker. The eVeRydAy ZomBIES Deck is a totally unique deck of playing cards, both a traditional deck and a delightfully spooky set of survival tips in case of zombie attacks. Plus, gone are the usual face cards; our royals and jokers have joined the horde. The Zombie Deck features original artwork on the front and back of the cards, including zombified face cards and jokers. Standard Poker Wide Size cards: 2-1/2 inches wide by 3-1/2 inches high. -New, Sealed in original package.